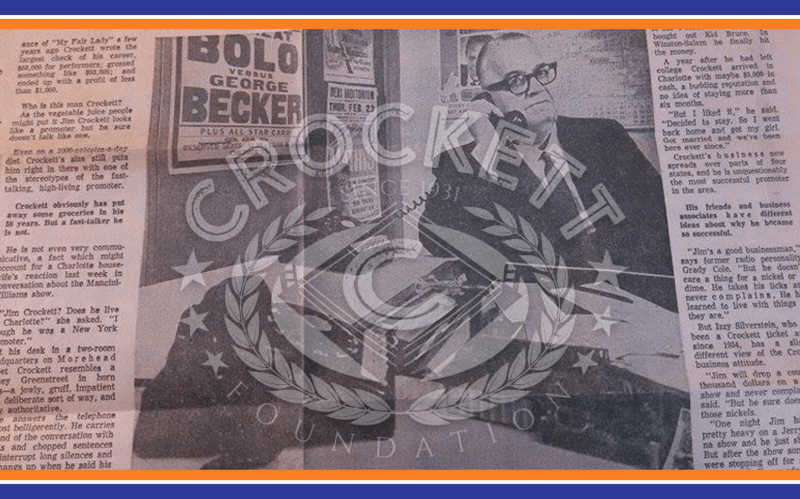 He Gambles on Public and Wins | Crockett Foundation - Tag In & Help Out! When you have a grandfather like Jim Crockett, you, as a child, have a very different perception of this man than the rest of the world. A family member just mailed me an article from April, 1967 that is a great read about how this man was seen by the public. The copy is in pretty bad shape but the following is word for word the article that was written by Charlotte Observer Staff Writer Dwayne Walls. It is always very interesting to see how the rest of the world perceived the man I called Grand Daddy. Belligerent. Impatient. Gruff….only if you tried to change the channel to Mutual of Omaha’s Wild Kingdom while napped in his chair with 60 Minutes on the television. “I was watching that” was about as gruff as it got as he closed his eyes again with smile on his face. On stage the 45-piece Henry Mancini band glided into the opening bars of a sound that is almost familiar as the national anthem. Among the darkened tiers in Charlotte Coliseum thousands of people picked up the tune with silent, rhythmic twitching of music and mind. Out beyond the main turn-style a 323-pound mountain of named James Allen Crockett grunted satisfactorily and headed toward the office of Coliseum Manager Paul Buck. There, in a specially made chair, under the sound of music and voices and clapping hands and a wall plaque proclaiming “Ali Baba was a fortunate man indeed. He had only 40 thieves to deal with,” Promoter Jim Crockett counted up the $4, $5, and $6 tickets and pronounced the evening a success. Again he had gambled and won. Crockett has been gambling-and winning more often than not-on the public taste in entertainment for the better part of his 58 years. The measure of his success is the fact that many people in Charlotte consider him something of a municipal asset, to be included along with the auditorium, the coliseum, the public library, the Mint Museum and the university as things the Chamber of Commerce touts to industries on the move. As one of his friends said recently it would take a book to tell how much entertainment Crockett has brought into Charlotte and the Carolinas since he came here nearly 34 years ago. In the Big Band era of the 30s and 40s practically every big name in the business played somewhere in the Carolinas-because of Crockett. When Rock and Roll came along it was Crockett who stated the wild-beat rhythm in Carolinas legs. He has brought in Broadway plays and musicals, cowboys and indians, hot comedians and even a dog, Lassie. And of course, Crockett has made wrestling into a weekly ritual in this part of the country. “The money he makes on wrestling pays for bringing in some of the less profitable things,” says rival promoter T.D. Kemp, Jr.
And Crockett has had his share of “less profitable” ventures. Old time comedian Ben Bernie was a disaster at the box office. But the real box-office bomb in recent years was Crockett’s promotion of a package deal starring the Lone Ranger and Lassie. Some of the eggs have been laid deliberately-for prestige, Crockett says, instead of profit. For the seven-show performance of “My Fair Lady” a few years ago Crockett wrote the largest check of his career, $68,000 for performers; grossed something like $93,000; and ended up with a profit of less than $1,000. Who is this man Crockett? As the vegetable juice people might put it Jim Crockett looks like a promoter but he sure doesn’t talk like one. Even at a 1,000-calories a day diet, Crockett’s size still puts him right in there with one of the stereotypes of the fast talking, high living promoter. Crockett obviously has put away some groceries in his 58 years. But a fast-talker he is not. He is not even very communicative, a fact which might account for a Charlotte housewife’s reaction last week in conversation about the Mancini-Williams show. At his desk in a two-room headquarters on Morehead Street Crockett resembles a Sidney Greenstreet in horn rims-a jowly, gruff, impatient in a deliberate sort of way, and very authoritative. He answers the telephone almost belligerently. He carries his end of the conversation with grunts and chopped sentences that interrupt long silences and then hangs up when he said his piece. Sometimes he hangs up very abruptly. Four times in one hour recently the telephone left Crockett’s ear on the way to its cradle while there was talk still coming through the receiver. Lots of people know Jim Crockett. As a high school student Crockett worked part time for a local boxing promoter. His big job was to line up boxes for the “battle royal” that warmed up the crowd before the main event. Boxing was illegal then in Virginia. To get the local police chief to turn his head Crockett would include on the bill some local amateurs from the YMCA. Crockett kept lining up battle royals through high school and two years at a local college and then he agreed to line up a benefit boxing match for the Salvation Army. When he couldn’t find the boxers be put wrestlers on instead and that did it. At breakfast one morning he told his parents he was through with college. With a T-Model Ford and a boxer names Kid Bruce for a partner Crockett hit the hustling as a professional wrestling promoter. Somewhere in one of the mountain towns of Virginia, or West Virginia he said goodbye to the T-Model. In Roanoke, he bought out Kid Bruce. In Winston Salem he finally hit the money. A year after he had left college Crockett arrived in Charlotte with maybe $5,000 in cash, a building reputation and no idea of staying more than six months. Crockett’s business now spreads over parts of four states, and he is unquestionably the most successful promoter in the area. His friends and business associates have different ideas about why he became so successful. But Izzy Silverstein, who has been a Crockett ticket agent since 1934, has a slightly different view of the Crockett business attitude. Silverstein also recalled a visit years ago he and the late Observer Editor Jake Wade made with Crockett in New York. Crockett’s reputation for taking his losses with good grace is legend among his friends. Once after Crockett had lost a bundle on a roller derby a few years ago he dropped by Buck’s home to sample some Union County turkey. Aside from his nickel watching and his tendency to hand up on callers Crockett has some other quirks. He absolutely cannot stand for anybody in the car with him to go to sleep while Crockett is driving, and he makes a studied effort to keep anybody from finding out he is a soft touch for charity. Crockett might deny it publicly, but he also signs three-figure checks to charity with some regularity. Crockett promotes maybe 100 events a year in the Southeast. But wrestling remains his favorite love. He has a policy now, though, against stepping into the ring as he used to. One night a few years ago one of his wrestlers went berserk and Crockett climbed into the ring to cool him off. The wrestler cut loose with a monstrous blow that floored Crockett and sent Crockett’s hat sailing into the 12th row. Some wise guy at ringside, never really convinced that everything about wrestling is not fixed, could not miss a golden opportunity.